The C145B Cross Strap Pool Chaise Lounge has a woven pattern crafted with double-wrapped 2-inch vinyl straps. The frame is constructed from 1-inch round extruded aluminum tubing and has an integrated armrest design. The sled style legs face inward, making them less of a tripping hazard for foot traffic. The C145B Cross Strap Pool Chaise Lounge is ideal for water parks, resorts, and community pools. Customize it with an extensive offering of powder-coat finishes and vinyl strap colors. 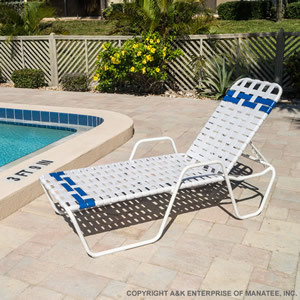 The C145B Cross Strap Pool Chaise Lounge has built-in safety features, an adjustable headrest with solid aluminum ratchets, and comes with a commercial warranty.